Supporting migrants and refugees during their integration into the receiving countries and societies is a major task all over Europe. Their participation in continuing education is often lower than that of the local population. During our research we found some extraordinary approaches and projects for a better support of people with a migration background. Quali-Fair addresses people whose first language is not German, who live in Austria, and who would like access to further training and education opportunities (medium and high level), but are confronted with various barriers (information deficits, linguistic barriers, apparently impassable entrance exams, etc.). In the framework of Quali-Fair people from the target group can work towards acquiring competences and reaching their educational goals together with expert educational trainers. Together, they design a detailed educational plan for the gradual attainment of the educational goal, and clarify or create the necessary external conditions for the realisation of the educational plan. In the realisation process of the educational plan, participants receive intensive support from the educational trainers and the Open Learning Centre. The aim of Quali-Fair is to place participants in courses/training and opportunities/jobs, based on their competences rather than assigning them to courses/jobs that happen to be offered at the time. In order to achieve this, the Quali-Fair “Description of Competences” is vital as a tool that offers a holistic view of the individual competences of each participant and thus forms the basis for each individual’s ideal training or further education. It is essential to consider all of the participant’s formally and informally acquired skills and competences, as well as his/her wishes, expectations and aims. After embarking on an educational path, participants are not left alone; they are accompanied until the successful completion of the training/course. The Open Learning Centre offers easy access to PC-workstations, various learning materials, e-learning possibilities and active consideration with existing training and educational offers. The contents of the tutorials regarding knowledge transfer and the learning material are tailored to the participants’ needs. Quali-Fair is unique due to its holistic approach that comprises both training and education. It offers support to its participants from the decision on a specific educational path, to the successful completion of the respective training or educational programme. The project is flexible and specifically target group oriented. By engaging intensively with their competences and aims, participants are able to reduce educational barriers and to access educational resources. Due to the free and open access to the Open Learning Centre and the highly individualised possibilities of using it, education is opened up also to people who cannot profit from other, more formalised types of education because they have differing or limited time resources, cannot afford to pay for a course, or simply do not have the space and quiet that is necessary for studying and making progress at home. The Quali-Fair project was conducted from BFI Tirol in cooperation with Diakonie Fluechtlingsdienst Wien, Caritas der Diözese Graz-Seckau, innovia - Service und Beratung zur Chancengleichheit and funded by the Federal Ministry of Education and Woman and the European Social Fund. Sweden, like Holland, is known for its many different associations and society´s where many issues in the society are handled. The official Sweden, governments on stately, regional and local levels also use associations as a counterpart when changes are discussed. Therefore the official goal towards new immigration groups in Sweden has been to promote them to start associations, organised on local, regional and stately levels. 1. Equality and democracy principle; the work is based on equality among the circle members. 2. Liberation principle; the work in the study circle should proceed from the members experiences and knowledge, and liberate their assets and resources. 3. Co-operation and companionship principle; working together towards mutually shared end resolved objectives, to help each other instead of competing. 4. The principle of freedom; the objectives of the study circle are determined by the members needs and wishes. 5. The principle of continuity and planning; the studies in a study circle shall create and maintain an interest in further studies. The members set up a plan for the studies, for example how often they should meet etc. 6. Active participation principle; everybody has a duty to participate and be active. 7. The principle of study material; many study circles create their own material. 8. The principle of change and action; the members don´t only learn for their own sake but the study circle strives for change and action. For individuals this can result in personal enrichment and an improvement of their own environment. 20 women participated in the study circle for a year and studied human rights, how to work against discrimination and racism, how to identify bullying methods in associations, functions and responsibilities of the board, how to apply for financing, rhetoric and how to express themselves in front of a big group. The group also produced a book as an inspiration for women with foreign background in the word of associations that can be used in future study circles. The study circle ended in November 2014. 7 of the 20 participants started different women´s associations and the rest felt ready to participate in various tasks as members of a board. 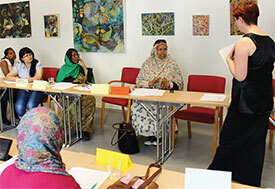 This was a successful and innovative way to strengthen immigrant women´s influence in the Swedish society. 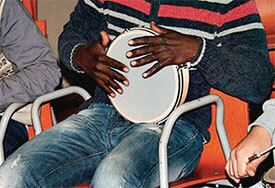 In Italy the Protection System for Asylum Seekers (SPRAR), established by Law no. 189/2002, is a network of local authorities (Municipalities and Provinces) that perform projects for asylum seekers and refugees accessing the National Fund for asylum policies and services run by the Ministry of Interior. The SPRAR Coordination is guaranteed by the Central Service with tasks of information, promotion, advice and technical assistance to local authorities, as well as monitoring of the project activities for seekers and beneficiaries of international protection in Italy. The target group are asylum seekers and refugees who arrive in Italy by sea or by land frontiers, often in conditions that pose a serious risk to their lives, to seek protection. Their application for protection is examined by committees in which asylum seekers explain the reason for their escape. Those who receive a "positive response" can obtain refugee status or becoming beneficiaries of international protection. The south coast, but also the land borders of north-east Italy, have for years been coming under increasing pressure for the constant arrivals of migrants seeking asylum in the country. They are men, women and children forced to flee their country because of persecution, war, human rights violations. They had to abandon their home, work, family, friends, loved ones, their homes, habits, normality of daily life. Many of them will never see the most loved ones. Many of them have been subjected to torture, extreme violence and have lived through the dramatic experience of the shipwreck. To seek protection in Europe has made long trips. In inhuman conditions they have crossed continents, states, deserts, seas and risk losing everything. Even life. The purpose of the Protection System for Asylum Seekers (SPRAR) is to guarantee integrated reception of second level to asylum seekers and refugees. For this reason, starting from the experience of hospitality and decentralised network, built between 1999 and 2000 by municipalities, associations and NGOs, in 2001 the Ministry of the Interior Department for Civil Liberties and Immigration, the National Association of Italian Municipalities (ANCI) and the United Nations High Commissioner for Refugees (UNHCR) signed a Memorandum of Understanding for the creation of a "National Programme for asylum" (PNA). This was the birth of the first trial of a public system for the reception of asylum seekers and refugees, spread throughout the Italian territory, with the involvement of central and local institutions, according to a sharing of responsibility between the Ministry of Interior and local authorities. The law n.189/2002 subsequently institutionalised these measures reception organised, providing for the establishment of the SPRAR system. The reception centres system SPRAR has a role in this sense of privileged observatory on the territory. The method to which reference may be made is the definition of the signalling patterns that can be used by this Welfare. Regional local authorities, with the support of the third sector, provide interventions of "integrated reception" that exceed the mere distribution of board and lodging, providing a complement of measures like information, support, assistance and guidance through the construction of individual pathways of socio-economic development. We speak here of forced migrants who often bring with them great trauma and suffering, in the host countries, a culture shock not indifferent. Taking care of these people it is meant to recover them their autonomy through a series of services that start from the welcome material (refreshments and a safe place) to the orientation and access to local services, to Italian language teaching, training and retraining, guidance and accompaniment at providing employment, housing and social, legal protection and psycho-social health. Also as part of the reception of applicants and beneficiaries of international protection, as well as more generally in the area of social services, it refers to the concept of empowerment, it understood as an individual process and organised, through which individuals can (re)build their capacity to choose and design and (re)acquire the perception of its value, of their potential and opportunities. 1. Multi-level as it is a co-management between the national level (Ministry of Interior/Servizio Centrale), local authorities (Municipalities, Union of Municipalities and Provinces) and organisations of third sector. 2. With a decentralised management and sustainable as the welcome centres are located in the municipalities. 3. Aimed at strengthening the territorial network and the boost to the consolidation of the welfare in the territories in view of equal opportunities, facilitating access to rights/services and civil intercultural coexistence. The aim of Melete is to identify barriers concerning education for educationally disadvantaged people with a migration background, and to find and test ways of reducing these barriers, and disadvantages for the target group. The project offers easy access to starting further education and everyday learning by means of various approaches and methods (participation, mentoring, peer to peer approaches, etc.). At Melete, migrants who have been living in Austria for a long time are offered training as “educational guides”. Speakers from Salzburg’s educational and counselling institutions convey everything about (further) education. The trained guides then conduct valuable informational and motivational work in their respective communities, and potential participants receive information about the free offers of Melete. These offers range from low-threshold opportunities like cooking together with an “integrated German course”, to parental education and educational offers such as basics in computer literacy or mathematics for everyday life. In addition, learning mentors are trained in order to accompany participants according to their individual learning needs. A significant success factor of Melete is the broad networking and collaboration with educational and counselling institutions, migrant organisations, and advocacy groups. Through this, Melete and its offers are present in various institutions and at various events (e.g., brief educational inputs at intercultural breakfasts, offers at residence services, etc.). Melete uses a wealth of different methods and approaches to reach as many people as possible. Examples: In all of Melete’s offers, there are trainers and/or co-trainers with a migration background. They are better suited to grasping and dealing with the individual problems of the target group, and they can also serve as role models. In order to decide on the contents of the various educational offers participation workshops were held with educational guides and the participants of basic educational courses. Easy access and participant- orientation are achieved, for example, by offering courses for free, choosing familiar learning locations, not requiring previous knowledge (such as a certain language proficiency), or adapting course contents to the everyday lives of the participants (using authentic material such as bus timetables or package inserts). Targeted PR for sensitisation and broad networking with various institutions and advocacy groups of the target group has led to the fact that Melete is now perceived as a regional brand that stands for successful and target-group oriented work with and for migrants. ➜ In cooperation with social service departments of municipal authorities of the cities. The use of graduates of previous projects that successfully addressed potential bidders in their place of residence (in socially. excluded area) are utilised as role models. The project concept is, with minor changes reflecting the specifics of the particular region, seamlessly transferable to other regions. (The proof is in an almost identical project implementation with similar results in Liberec town). In regards to other countries, it is our opinion, that with some modifications and specific tailoring to the needs of the neighbouring countries, which have similar socio-cultural characteristics (such as Slovakia, Poland), the project can be successfully replicated. The implementing organisation and its partners continue to work with the target group through other related projects within different areas in Moravia and the Olomouc region. The project “Innovative methods and practices to facilitate social inclusion” talks about social exclusion, which is still very high in European Union countries, and offers to strengthen the bottom-up approach to increase capacity and the willingness of socially excluded people to be fully integrated into society. The project introduces a Social Mobility Model – the new learning pathways for increasing social mobility to overcome social exclusion. The project was implemented by eight organisations from six European countries: Czech Republic, Germany, Lithuania, Spain, The Netherlands and United Kingdom. The project addresses unemployed people with a special emphasis on women, senior citizens and migrants. The project aims to increase the level of social inclusion of the target groups, equip them with knowledge and competences in order to be active in society and the labour market. 1. The method “Group social mentoring” that uses a group-based methodology to ensure the optimal use of the mentor’s experience by working with small groups of socially excluded persons with similar problems. 2. The role model of social inclusion as an educational tool for learners to strengthen self-confidence by learning from personal experience of people who have overcome social exclusion and successfully moved to social inclusion. 3. Providing training material for visual workshops on equal opportunities and non-discrimination. The Social Mobility Model can easily be transferred to other countries. Available on-line are various materials of the project, i.e. presentations, video sets, e-workbooks, guidelines. All material is available in English and part of the material is also available in Czech, Dutch, German, Lithuanian and Spanish. The project outcome “Social Mobility Model (SMM)” is introduced with the combining of the three interlinked educational pathways indicated above, and is a great tool for organisations (adult educators, adult education organisations, NGOs, community centres), that work in the field of social inclusion, helping socially disadvantaged persons to move from social exclusion into social inclusion. The educational programme Gendalos is an on-going project coordinated by IQ Roma servis, o.s. in Brno, Czech Republic since September 2013. Gendalos is a comprehensive programme that supports young Roma to increase their chances in the job market. The programme services are free and accessible to everyone within the target group. Due to poor social and learning skills Roma students have less chances to find a job on a level they are actually capable of. With the project’s support, young Roma receive a better chance to achieve the educational level they are truly capable of, and therefore have much better chance to gain employment. The main goal of project Gendalos is to develop and improve the social skills, as well as the cognitive skills with regard to achieving a higher level of education. 1. Roma students in high schools, colleges or universities in ages between 15 and 26 years. 2. Pupils from grade eight and nine are approximately 13 or 14 years old. This is crucial period when many have to come to a decision on which particular secondary school they will attend. 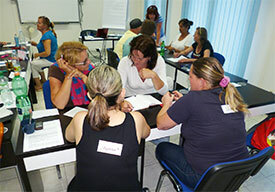 Gendalos cooperates with teachers, school psychologists, etc. from each of the elementary and high schools we work with, and offers the programme to schools with Roma students. Roma students will take an active part whereby bringing their interests and requirements into Gendalos. Also parents and volunteers, who support students in regard to problematic subjects, are incorporated into the programme. The starting point of the project was based on a try out period, and in September 2013 it officially began. To date, the students are more than just clients, they involved themselves in all aspects of the programme. Students actively take part, bringing their interests and needs into Gendalos. Children from grade eight and nine receive help with studies to increase their opportunities to obtain a higher level of secondary school. During a three meeting process at school, the pros and cons of the various secondary schools are explained. Gendalos also offers support in learning. The programme helps students to pass the critical first year of high school. The first year is usually the most challenging year because it is a transition period. Good social and learning skills determine how students manage to adjust. New school, new classmates, and information overload, and a difficult curriculum, are many of the challenges for all the students at this time. Gendalos focuses more on the training aspect for social competence and for learning techniques during the first year of secondary school. Furthermore, IQ Roma services organise conferences and presentations for several public organisations such as e.g. the government and authorities. The fund-raising is combined with events. The foundation of the programme is the integrated cooperation with motivated Roma students and the involvement of parents and schools. This programme is replicable anywhere. Working with motivated students is very meaningful, because students have their own visions for their lives and we play more of a supportive role in their process. With 'Gendalos' Roma students aged between 13 and 26 get a better chance on the employment market by support for them during education.